Maxwell oversaw the manufacturing process at their to-the-trade furniture company, Silhouette (now sold), which customized many pieces for the weekend house. This gave them the flexibility to take a given item, such as a buffet, and stretch it into a longer credenza with different doors and finishes. Or to interpret original midcentury pieces in a fresh wood or at a larger scale, or to design a new coffee table or console with legs inspired by a Selig Z chair. ‘Kalahari 1 & 2’ by Chase Langford hang on both sides of the bespoke Florence buffet, with matching custom benches below. The Laurel lamp’s cord is threaded through a carefully drilled hole in the base of the vintage Saarinen table. Many of the outdoor furnishings are custom as well, from the blue cord chaise longues and the tri-shade sheltering the steps of the pool, to the built-for-lolling daybeds with white concrete bases. Hunt worked with landscape designer Gordon Kurtis on the concept for the front and back yards, which include an outdoor kitchen, multiple fire pits, desert plantings, select insets of turf and three palm trees that were craned into place over the house. A now-friend, artist Chase Langford (whose house AR has also featured), contributed to the house after a fashion, too. His works now hang in the dining room, bedrooms and living room. 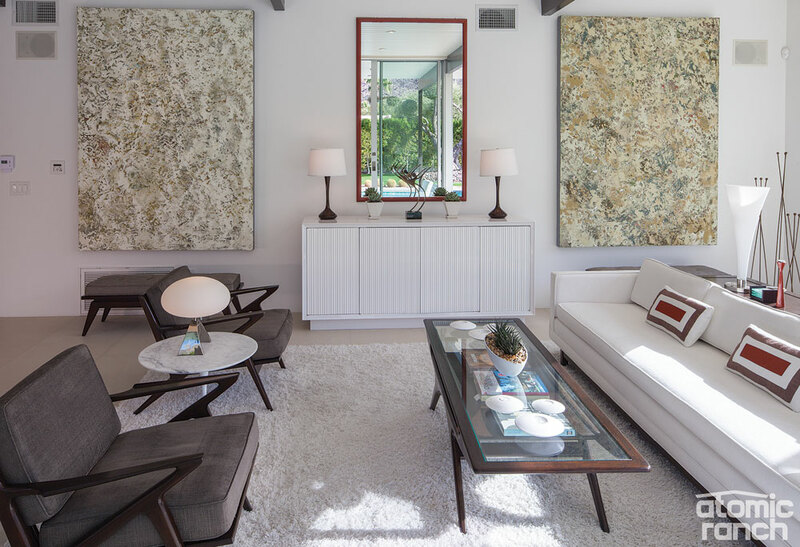 “I took Chase’s paintings in the living room and pulled colors out of them, but wanted to keep it a very neutral background—clean and open and airy,” Hunt says.